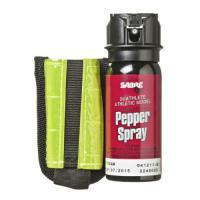 Sabre MK-3-AM-US Sabre Red Duathlete Pepper Spray 1.8 oz. Home > Sabre > Pepper Spray > Personal Pepper Spray > MK-3-AM-US Sabre Red Duathlete Pepper Spray 1.8 oz. MK-3-AM-US Sabre Red Duathlete Pepper Spray 1.8 oz. Whether cycling trails or running through urban streets, the Sabre Red Duathlete Pepper Spray is optimally suited for any athlete. The compact, 1.8 ounce canister is fitted with a reflective arm band that adjusts to fit your bicep without slipping or falling down. The armband's tear-away construction ensures your spray is readily available at a moments notice. Duathlete's powerful stream reduces wind-blowback and offers 20 quick shots at distances up to 15 feet away. *State laws prohibit shipment of this model to the following states: AK, DC, HI, MA, NJ, NY & SC. ©2002-2019 CopsPlus.com: Sabre MK-3-AM-US Sabre Red Duathlete Pepper Spray 1.8 oz.